When choosing kids furniture, toys, and other equipment and supplies for a day nursery or other type of childcare facility, it's important to remember that it is often more cost efficient to choose high quality products. While it can be tempting to choose cheaper items, especially in the beginning when there are so many purchases to be made at once, but in the long run, investing is high quality teacher supplies usually saves money. 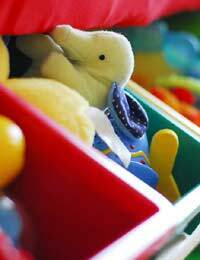 When opening a childcare business, initial expenses can be considerable. Buying or leasing a building, making modifications to maximize the usability for children of varying ages, cots, bedding, kitchen items, toys, outdoor playground equipment, books, and assorted educational supplies can be costly, taking a large bite out of allocated start-up costs. There are other expenses, of course, such as licensing costs, advertising, and office supplies, and when the costs are tallied, many potential nursery owners feel a bit deflated, wondering how they'll manage. It can be tempting (and even necessary) to cut corners here and there, but it's important to exercise caution when deciding where to trim expenses. The CE Mark: This mark has been required to be placed on all toys placed in the market in the European Union since January 1990. While it doesn't necessarily indicate a highly rated item, it does show that the product meets the safety requirement of the European Toy Safety Directive. The Lion Mark: Developed by the British Toy & Hobby Association in 1988 to indicate toys that have met strict standards of both safety and quality. The Kite Mark: Products carrying the Kite Mark indicates that they have been independently tested to be sure that they perform up to par in accordance with expectation set by the British Standards Institution. Parents and professionals can rest easy when choosing products bearing the Kite Mark, as they should be safe and reliable. While safety marks are helpful, it's important to remember that proper assembly and maintenance of all children's products is vital. Kids' furniture and outdoor playground equipment can be especially dangerous if they are not put together well and used in accordance with the manufacturer's specifications. Many toys and other children's products come with guidelines for use by children if specific age groups and these recommendations should be heeded. They are typically put into place not to indicate which ages of kids will enjoy the products, but instead which are likely to be developmentally ready to use them safely and appropriately. Many online retailers carry a wide selection of goods specifically for use by teachers and other childcare professionals. Teacher supplies may be a bit more costly than similar products that are marketed for home use, but they are typically of a much higher quality, designed to stand up to heavy use. Kids furniture pieces, for example may be heavier and sturdier so that they hold up during the everyday wear and tear typical to childcare facilities. Additionally, such sites ordinarily keep abreast of the latest product developments, so shopping with these retailers often affords nursery owners the latest trends in children's toys and equipment. Even the very best toys, kids' furniture, and other children's equipment will eventually need repair or replacement, so it is important that funds be set aside to maintain a good supply of daycare products. When setting fees for the centres, owners must consider not only their regular ongoing costs, but those that are sure to crop up now and then without warning. Re: What Qualifications Are Needed to Run a Nursery? Re: What Licence do I need to Operate a Nursery? I am an Indian. What qualification would need to become a owner & teacher of nursery school?